Last month, I blogged about how the 35,000 mile sign-up bonus from the Bank of America Hawaiian Airline credit card could be transferred from Hawaiian Airlines to Hilton Honors. 70,000 Hilton Points In My Account! 35,000 Hawaiian Airlines miles becomes 70,000 Hilton Honors points, and if you apply for both the Bank of America and Bank of Hawaii issued Hawaiian Airlines cards you can get 140,000 Hilton Honors points. Note that the $79 annual fee is not waived for the first year and there is a $1,000 spend requirement within the first 4 months to get the bonus for each card. 70,000 Hilton Honors points is much more than the regular sign-up bonuses on the official Hilton HHonors cards issued by American Express (no fee + 50,000 points after $500 minimum spending within 3 months), American Express Surpass ($75 annual fee not waived +40,000 points after first purchase) or Citi (no fee + 50,000 points after $1,500 minimum spending within 6 months)! However, the Citi Hilton Honors comes with Silver elite status which gets you access to VIP awards, and the AMEX Hilton Honors card comes with Gold elite status for a year which gets you access to discounted VIP and AXON award nights. For example, a 4 night Hilton award in the top Category 7 hotels (such as the Conrad Maldives or Hilton Bora Bora) which regularly costs 200,000 points (4 nights X 50,000 points per night) is only 145,000 points under an AXON award and 170,000 points for a VIP award. Therefore, it makes sense to load up on Hilton points through the Hawaiian Airlines credit cards and then get the Citi or American Express “official” Hilton credit cards to get access to the discounted award nights and elite status benefits. But back to the transfer – It took 11 days for the Hawaiian Airline points to transfer to my Hilton account. 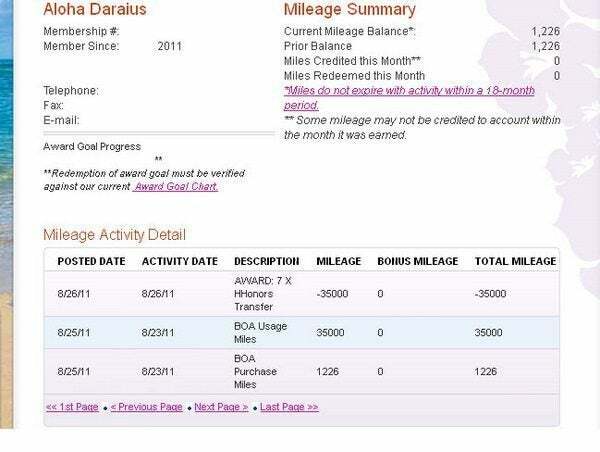 I called the Hawaiian Airlines service center at 877-426-4537 on August 20, 2011 and the points were in my Hilton Honors account 11 days later on August 31, 2011! Hawaiian Air to Hilton Transfer Took 11 Days! Emily and I are visiting London and Paris next year, and Hilton points will save us a lot of money on hotels and let us have Big Travel with Small Money! I will apply for the American Express Hilton Surpass card and the other Bank of Hawaii Hawaiian Airlines credit card in my next churn. The American Express card will give me access to discounted AXON awards and I will also get Gold elite status for a year which will give us free breakfast and internet access along with a chance of free room upgrades. Be aware that if you are approved for the Hawaiian Airlines Platinum credit card instead of the Signature credit card, Bank of America will sneakily award you only 10,000 miles instead of 35,000 miles. This is very bad form on Bank of America’s part. 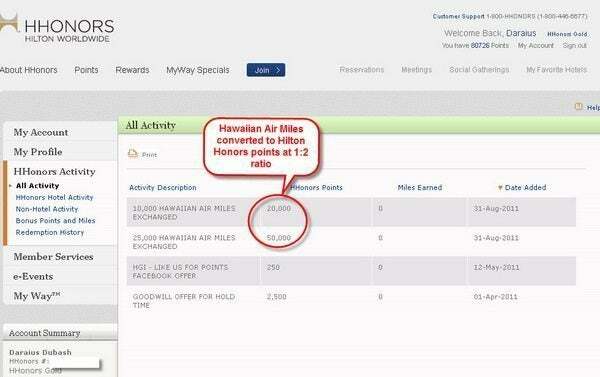 Have you transferred or are you considering transferring Hawaiian Airlines miles to Hilton Honors points? Disclosure: I don’t get any referral bonus or commission for any of the credit cards in this post. my miles are gonna expire in a couple of days. what should i do to extend it? I have closed my cc. @jenny – You could buy miles to extend the expiration. Do you lose the promotional miles when you cancel the card? @Jeff – You don’t lose miles for canceling the card. I applied for the BOA Hawaiian Airlines signature and just got the platnium in the mail instead. Huge bummer. Is there Anything I can do or should do to be reconsidered for the signature? Should I cancel the platnium before I even activate it? @Amanda – You could call, but in my experience they aren’t likely to reconsider you for the Signature card. I applied for the signature and just got the platnium in the mail. Huge bummer. Is there Anything I can do or should do to be reconsidered for the signature? Should I cancel the platnium before I even activate it? @Brian S – The transfer ratio is still 1:2 from Hawaiian Air to Hilton, but you have to call in to make the transfer.